It's the hybrid device that you just can't get out of your head. Two new pieces of information on the TX1 to follow up my report from Feb. 07. First, DPReview has published their comprehensive review of the "half camera - half HD video recorder" and struggled with some of the same issues that I have. When it comes to Canon's choice of video format they say: "...the use of M-JPEG for movies means that if you want to shoot even half an hour of footage you're going to need a pocketful of fast, large SD cards. And though the movie quality is excellent, you're getting nothing like the resolution you could expect from a decent dedicated DV camcorder." 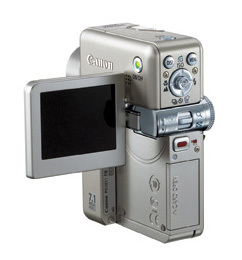 However, the reviewer, Simon Joinson, was tempted too by this intriguing device: "I'd really, really recommend going to a store and trying it for yourself before committing; this is a cool, fun gadget with surprisingly good image quality, but for me it's not a camera I found easy to live with - especially not at the best part of $500." I also had a conversation with my editor at Macworld Magazine. She had been casually using the TX1 for a couple weeks and was getting attached to the device. She addressed one of my other complaints, no option to plug in an external mic, by saying the stereo recording was quite good and better than other compact cameras she had tested. Obviously onboard-only mics have their limitations, but this was good news nonetheless. So there you have it... more on the device that we want to buy, but wrestle with its tradeoffs and $479 price tag. Let me know what you think if you have a chance to shoot with it.